Murren is a pretty village of wooden chalets and hotels perching on slopes covered in woods and meadows. In the summer, men farm the meadows for hay accompanied by the clanking of cowbells. Tourists sit in cafes or wander streets kept quiet by a ban on all but electric vehicles. The Eiger, Monch and outlying peaks of the Jungfrau across the valley provide a dramatic horizon of dark rock and bright snow. Standing in its centre it’s easy to not realise that this quiet Swiss village comes to an abrupt halt at sheer limestone cliffs that drop hundreds of metres to the bottom of the narrow Lauterbrunnen Valley. 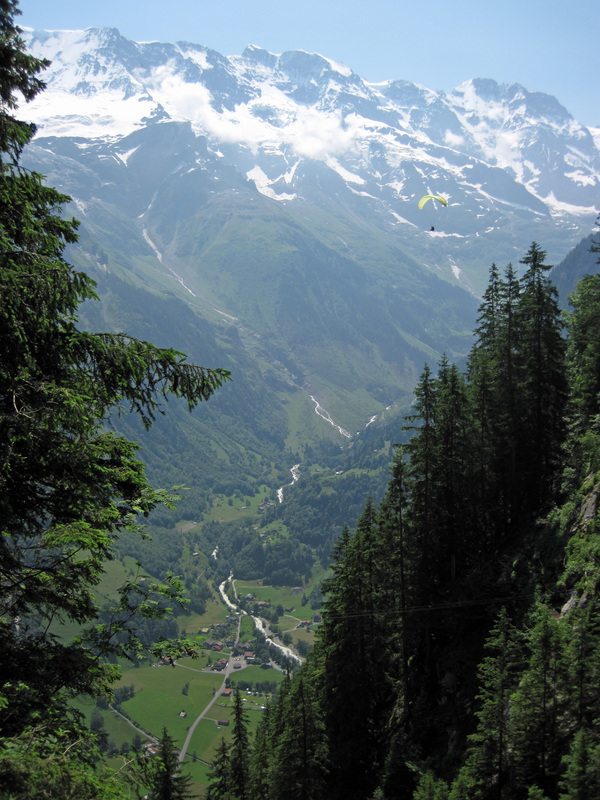 It’s this drop that makes Murren a favourite place for base-jumpers and paragliders. It’s also along the top of these cliffs that a brilliant via ferrata descends from Murren to the village of Gimmelwald by a route that seems designed to test your nerves. Gimmelwald (on the left) and Murren sitting above the cliffs of the Lauterbrunnen Valley. The Murren-Gimmelwald Via Ferrata was opened in 2008 after six years of construction. It was funded by contributions from local businesses and individuals, whose generosity is recognised in them being named on little plaques attached to rocks at periodic intervals along the route. It’s the most sponsored via ferrata I’ve ever done. 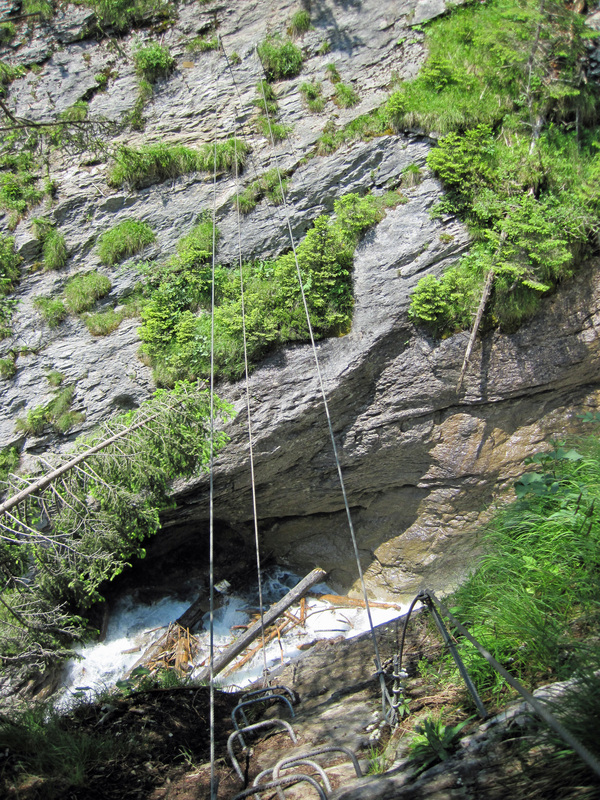 It’s often described as unusual for a via ferrata for going down instead of going up. This isn’t entirely accurate as saying a via ferrata goes up or down is a bit like saying a ladder goes up or down – it really depends on where you start from. What is accurate to say is that most vie ferrate are used for ascending and fewer are commonly used to descend a mountain. The Murren-Gimmelwald Via Ferrata has been built specifically for people to descend. This just adds to how it tries to unnerve you, as down-climbing is harder than climbing up and involves considerably more looking down at the drop. Strangely, this descent starts from the back of Murren’s tennis courts and is accessed via a tunnel under the courts. 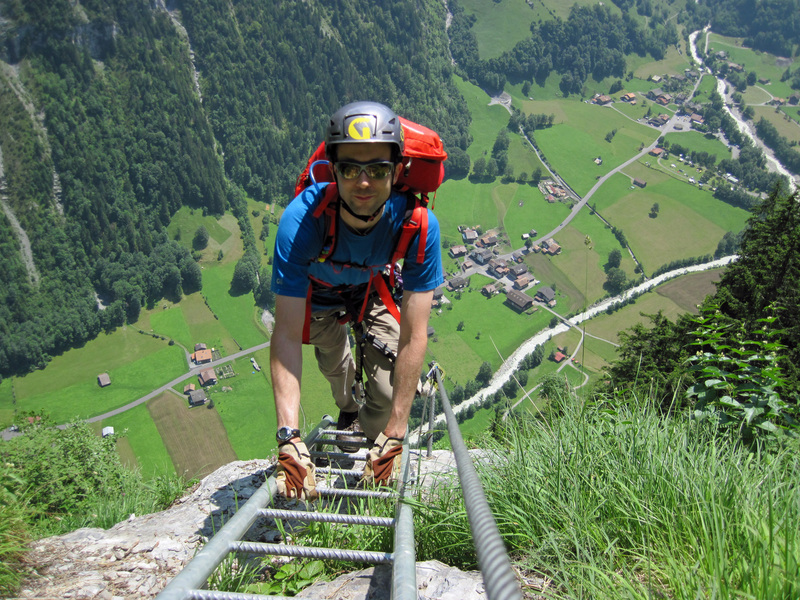 The via ferrata then descends and traverses through woods and over rock faces to Gimmelwald. What makes this route fun is how it’s been built to take advantage of the natural obstacles to give you a feeling of exposure and challenge you to overcome any nerves you might have about long falls. 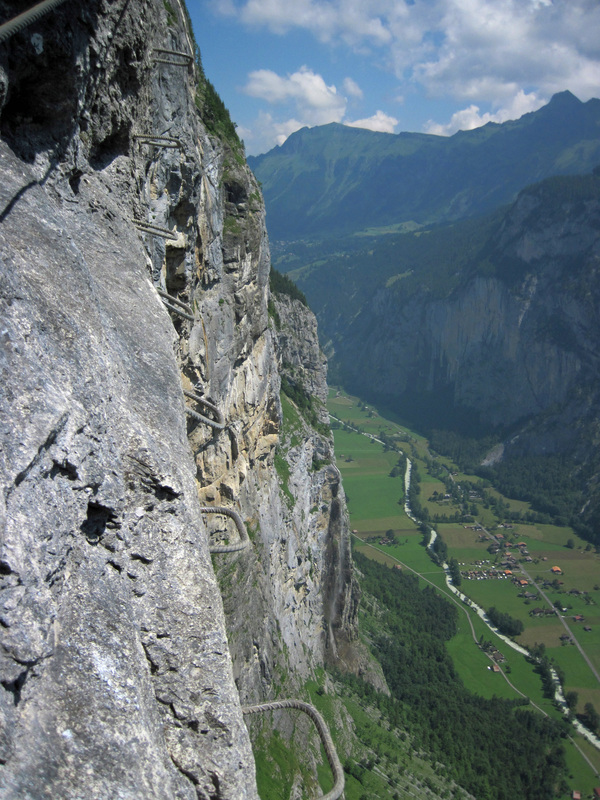 The first example of how this via ferrata puts you in an exposed position is also the best – a traverse along a series of stemples at the top of the Lauterbrunnen cliffs, with a 600-metre fall below your feet. 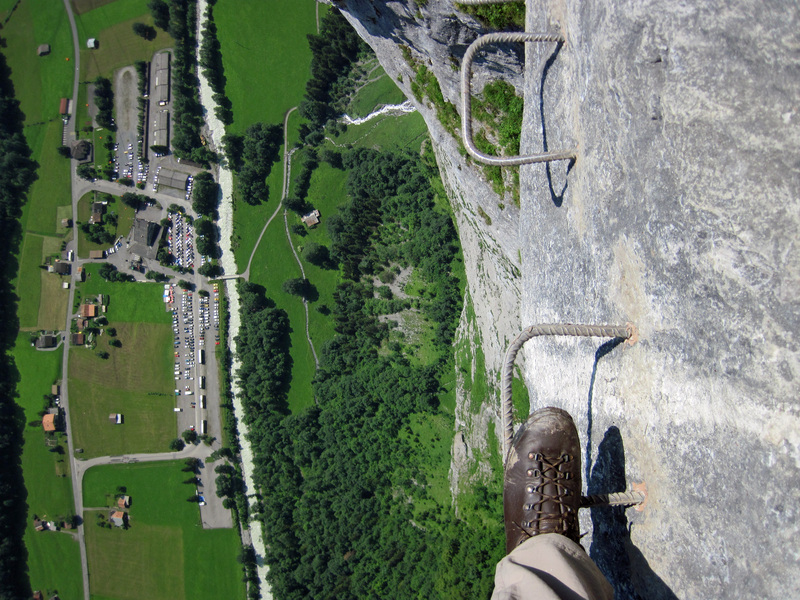 The drop is so steep and so far, that a wooden platform has been built here for basejumpers to launch themselves from. To make you feel the exposure even more, the path of the stemples descends vertically a couple of times. I hung on these stemples for a while enjoying the mix of exhilaration and nervousness at the exposure as well as the views of the wall of cliffs, the flat, green valley bottom with a river cutting it down the middle and the snow-covered peaks in the distance. Stemples descending the Lauterbrunnen cliffs and the Lauterbrunnen Valley. The other obstacles come from gorges cleaved out of the cliffs. The first of these can be crossed by a zip-wire, but only if a guide accompanies you. I didn’t feel the need to pay a guide just to use the zip-wire, so went away from the cliff and to a long Burma (three-wire) bridge that was strung across the gorge higher up. Its location was fantastic – passing close to a waterfall and surrounded by forest. I’ve done a much longer Burma bridge before, with a much bigger drop below it, but I felt more nervous about falling off this one. It swayed just enough to be disconcerting and as I inched across it was hard not to look at the rocks and water below. The second Burma bridge also crossed a gorge with a waterfall, but its shorter length meant less wobble and so I felt fine crossing it. Between these two Burma bridges were two fun sections of ladders. The first was straightforward climb down a short buttress, followed by crossing the run-off from a waterfall by stemples. The second section of ladders goes down a long cliff face and includes a middle ladder angled to throw you off balance a bit. 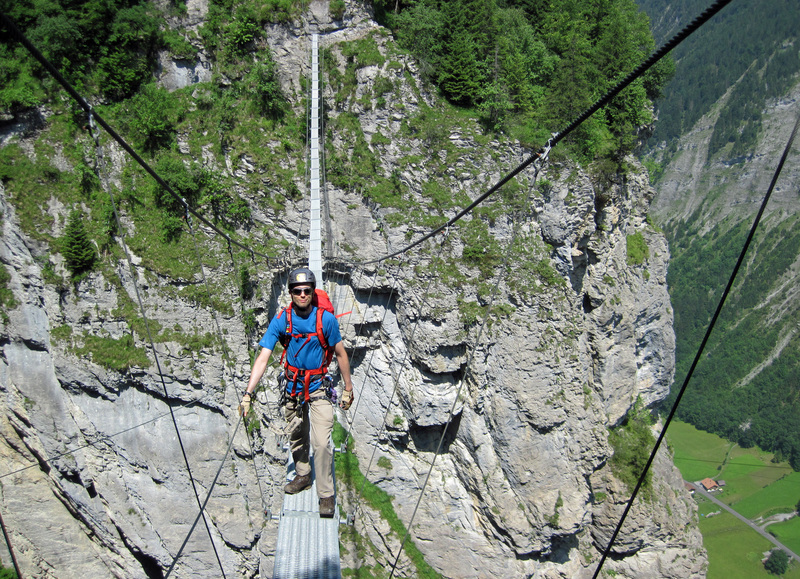 The last obstacle, and the finale, of the Murren-Gimmelwald Via Ferrata is an 80-metre suspension bridge over a 300-metre drop into a gorge. What made crossing this bridge a bit unsettling was that during the beginning and end thirds there weren’t any cables to use as handrails. There was a cable for clipping your lanyards on to, but this was only on one side of the bridge and I felt that holding on to this with one or both hands could send me off balance. There were vertical cables holding the walkway, but these were further apart than my reach and I could only hold them occasionally. Every small step I took also made the bridge sway. Once I got to the middle third of the bridge I could hold on to the cables from which the bridge was suspended and fully relax. Then I could enjoy the view of the valley and mountains and enjoy being in such a dramatic situation. 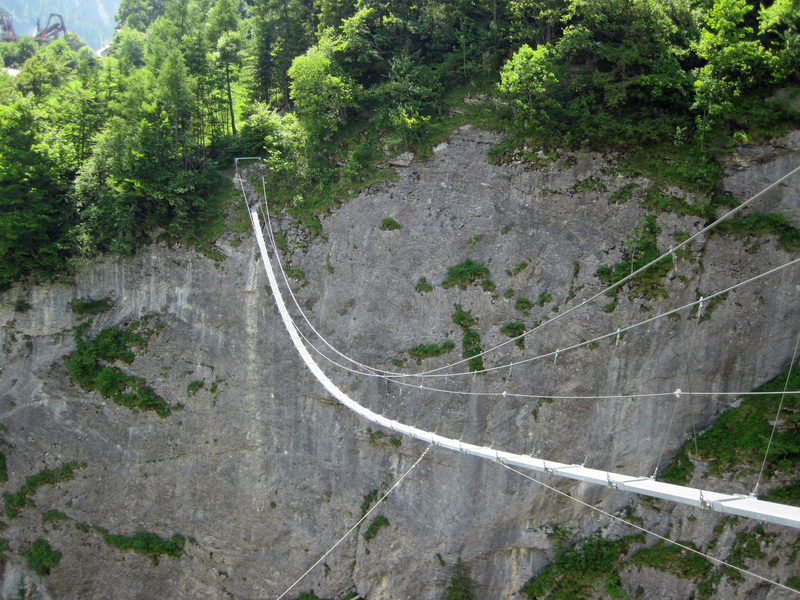 This bridge is close to the Schilthorn Bahn cablecar and I waved at one of the cars as it glided up to Gimmelwald. No one noticed – they were all too busy looking at the snowy mountains to see a man standing on a suspension bridge hundreds of metres in the air. After the bridge, the via ferrata made its way through the woods to Gimmelwald. 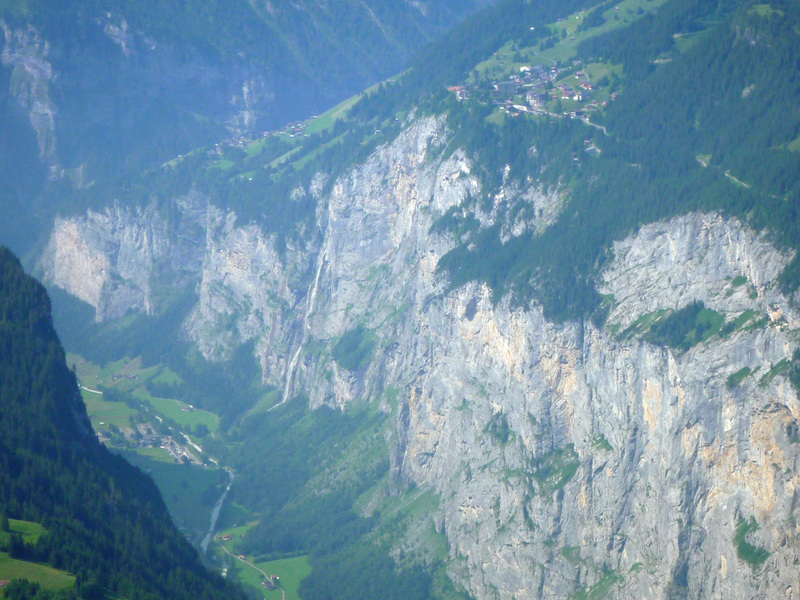 A view from the Murren-Gimmelwald Via Ferrata (including a paraglider). The Murren-Gimmelwald Via Ferrata is in the Bernese Oberland region of Switzerland. The main English language guidebook for Swiss vie ferrate – Via Ferrata Switzerland by Iris Kurschner – was published in 2005 and so doesn’t include any information on this via ferrata. However, the Murren-Gimmelwald Via Ferrata has its own website (in German and English) that provides information on how to get to the via ferrata, a simple map and a gallery of photos. A lot of this information can also be downloaded as a brochure. SummitPost has a good description of the route together with some excellent photos. The author also describes a different route to Murren than the one that I took – driving to Stechelberg and then taking the Schilthorn Bahn cable car to Gimmelwald, followed by a second cable car to Murren. I got to Murren by taking trains to Lauterbrunnen, followed by a cable car up to the top of the cliffs and a further train along to Murren. The Men Who Jump Off Cliffs is a great article on the Digital Nomad blog about the base jumpers who leap off the cliffs around Murren and Lauterbrunnen. Looks a great trip. Must get round to exploring some of Europe’s via ferrata. Have visited that area and as you say wonderful mountains all around. It was definitely a great trip. I love the Alps and the weather was good the whole time we were there. I’d certainly recommend the vie ferrate. A very good description of your down-climb. It seems quite full of exposure and I should have discovered via ferratas when I was climbing. The exposure was intense in places and this is definitely what made it a worthwhile, fun climb. There was also some gentle, pleasant walking in the woods on this via ferrata and it made for an interesting contrast. These wood walking sections probably give people a chance to catch their breath. I think you’d love climbing vie ferrate and it’s not too late to try one. Nice account and trip, and great photos. Thanks. I’m glad you like the post. It looked like it would be amazing, what with those massive, sheer cliffs and the beauty of the valley. I’ve never tried base jumping, but i I did, Murren would be where I’d like to go. just surfing the net and ran across your blog here… nice photography and web page layout! i truly enjoyed the FEAR that the pictures instilled in me, made my body flinch, as if i were on the cliff’s face in person. thank you for sharing, james newport wa. Thanks Nigel. Glad you liked the post. I’ve sent you an email directly to talk about using the photos.